It may be over 30 years old, it may have had less processing power than a washing machine, games may have taken around six minutes to load and it may have introduced the world to the wonder of ‘colour-clash’. But the ZX Spectrum is back and in a big way! The revolution started when Elite Systems, a company synonymous with Spectrum games, launched a kickstarter campaign to fund their Bluetooth ZX Spectrum. Despite courting much controversy, the product is expected to launch later this year. However, during its 12 months of development time, a new pretender entered the fray. The Sinclair ZX Spectrum Vega took a very different approach, but was no less successful in its own crowdfunding campaign. So with two very different machines offering the chance to get (re)aquainted with Britain’s most successful home computer, this article will look at each machine in turn, along with an alternative that is available now. Crowdfunding Description: The recreated Sinclair ZX Spectrum will be a Bluetooth keyboard, initially for iOS and subsequently Android / Windows phones & tablets. Originally branded as the ‘Bluetooth ZX Spectrum’, the device is basically a custom bluetooth controller for use on mobile and desktop machines, using the exact size, look and feel of the traditional rubber keyed ZX Spectrum computer. 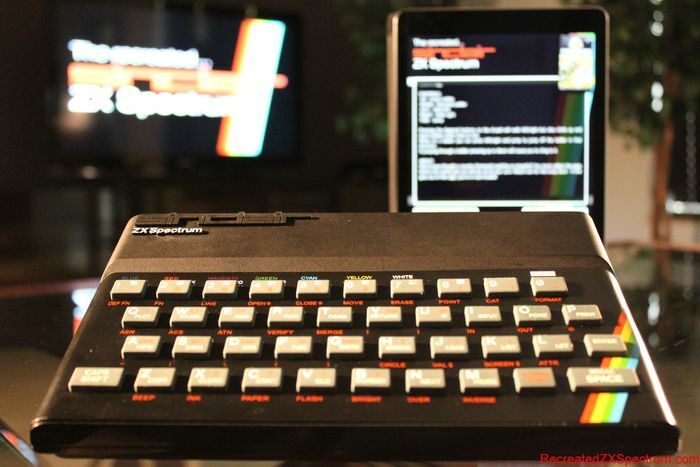 It is designed to be fully compatible with Elite Systems’ own ZX Spectrum smartphone apps, but is also expected to be fully functioning for other generic purposes (though we can’t imagine anyone using the rubber keyboard as a replacement for their standard one). Free and paid for games are downloaded to the app from Elite’s game store. However a fully fledged 8bit-storm dampened enthusiasm for the product when it became apparent that Elite Systems had not honoured previous royalty agreements with original game authors for access to their games on the ‘ZX Spectrum: Elite Collection’. Elite chief Steve Wilcox promised to remedy the situation with 28 days, but it is understood that there are still rumblings of discontent within the developer community. The product is available for pre-order with prices ranging from £50.00 for a standard model to £130.00 for a signed limited edition. Of course you could just use Elite’s rather nifty app without the bluetooth controller, but we have found that a number of the games struggle with on-screen touch controls. Crowdfunding Description: The Sinclair Spectrum Vega is a new games computer based on Sir Clive’s hugely successful Spectrum. The ‘Vega’ takes a very different approach and pulls in the big guns of Sir Clive Sinclair (the man who’s name adorns the original machine), Chris Smith (a former ZX Spectrum games developer self professed world’s leading expert on Sinclair Spectrum technology) and Dr David Levy (International Master of chess, noted for his involvement with both computer chess and artificial intelligence!?!). Taking its lead from the plug and play TV Game devices made popular by American toy company Jakks Pacific, the Vega is a consolised Spectrum emulator housed in a controlled shaped to be reminiscent of the original 48k Spectrum. Retro Computers plan to launch the machine with 1000 built in games, but once again the thorny issue of publishing rights has cropped up. Retro Computers claim to have reached agreements with many original developers to include their games in return for a payment of £5 to the Great Ormond Street Hospital charity for each of the first 4000 Vegas sold. However many have claimed that using the charity was simply a way to guilt developers into giving up their rights to games. A further plan to reward the developers (or the charity if they choose) on any sales beyond the initial 4000 would see them paid a percentage of the net selling price of a vega based on the number of games the developer makes available, however the maths don’t look good for more than a couple of pints. If my calculations are correct and assuming a £100 selling price with a 60% markup, that means that a total pot of £6 is available to rights owners per machine, or just £0.006 (a halfpenny) for each copy of a game. If this were a global product with huge appeal then it may add up to a good number by the time they receive their annual cheque. But this is a very niche, retro product, with a massive price tag and of course the developers get nothing for the first 4000 machines. 1 ZX Spectrum games often make use of the keyboard to perform additional game operations. We are therefore adding extra buttons to the Vega, giving the user direct access to such operations for the majority of games. 2 We are designing the Vega with the capacity for expansion by providing a hardware interface on it’s circuit board, and by allowing future software upgrades. Hopefully the hardware expansion will allow for USB joysticks and controllers to be used rather than the angular unit itself. Currently slated for a June 2015 release, we shouldn’t have too long to wait and see if the Vega lives up to its promise. Speccy Tape is a very useful application (available from the App Store) that links into the fantastic World of Spectrum archive to enable the loading of games into a real Spectrum computer (all models are supported) from your iPhone or other iOS device. Simply plug a standard mono cable between the EAR socket on your Spectrum and the Headphone socket on you device and you can use your phone in exactly the same way as a cassette player. 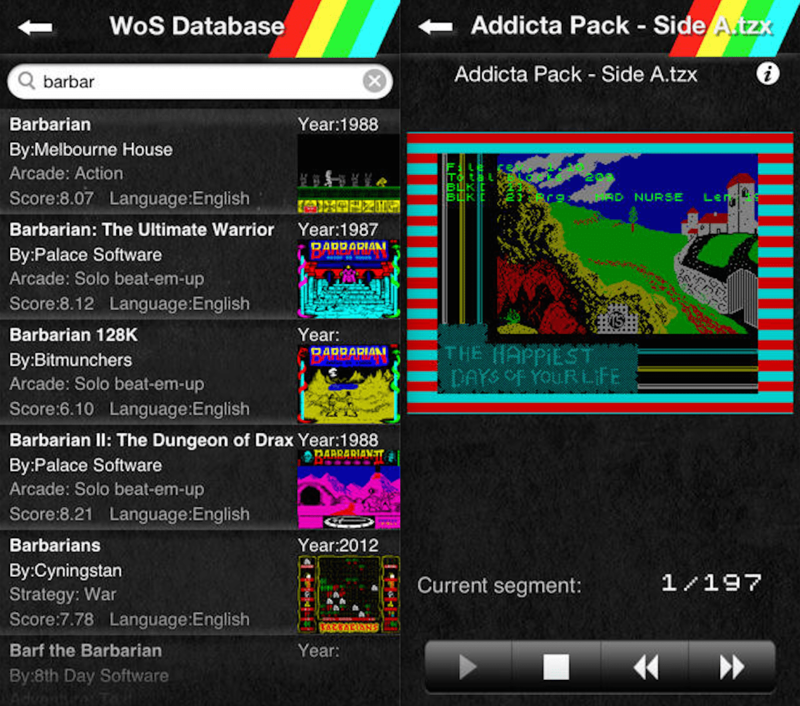 Using the simple interface you can search for a game on the WoS archive, download it to your phone, give your Spectrum its loading command (LOAD”” on a 48k model for example) and then press play on the app. Original hardware has increased significantly in price over the last few years, but it really is the purest way to relive the 80s. There is no substitute for the beautiful nostalgia of hearing those loading tones and watching a loading screen draw in front of you. Although of course, one downside of this against the new devices on offer is that it is not emulating the computer, this is a real Spectrum doing what a real Spectrum does, so get used to 5-10 minute loading times!